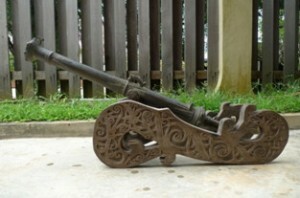 A popular collector’s item, antique cannons are a great reminder of our history and the battles that shaped our countries. A great testament to the industrious spirit of humanity, these historical pieces demonstrate the workmanship of ages past. For those interested in starting a collection or simply curious about the value of these antiques, here are some of the most valuable cannons available on ebay today. 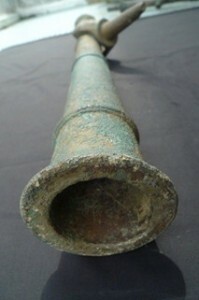 This 200 year old cannon was discovered underwater and is a very rare piece. 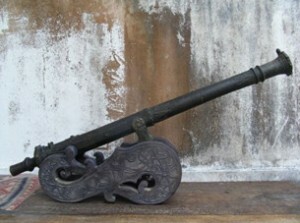 With its larger than usual muzzle and bore size it is an unusual cannon. Casted entirely in brass/bronze it will never rust and, due to its years spent underwater, it has a lovely freshwater patina. With a length of 33.9 inches, a diameter of 3.3 inches and a weight of 28.3 lbs., this is a small piece than some others currently available. All original and never repaired, the authenticity of this piece is assured. Origin: Brunei, Borneo. Asking price: $2999 + shipping. This Lantaka antique comes with a certified museum permit to guarantee authenticity and is also over 200 years old. Just over four feet long with a diameter of 4.7” and a weight of 73.2 lbs. this is a large and powerful piece. The trunion of this beautiful piece is decorated with floral patterns and it is 100% brass/bronze casted so it will never rust. Origin: Borneo. Asking price: $2500 + shipping. This 830 mm gorgeous, authentic signal cannon is damage free and has never been repaired. Almost 200 years old, it is made of 100% brass/bronze and weighs 38.5 lbs. 32.7” long with a diameter of 3.9” this is a medium sized piece from 1800-1850 with a unique dolphin handle. Origin: Borneo. Asking price: $2400 + shipping. 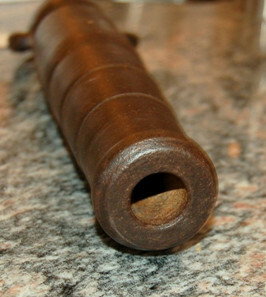 A great American collector’s item, this cannon hails from the Civil War era and was found near Vicksburg, MS. Made of 100% iron, this handheld signal cannon does not shoot a projectile as it is missing its fuse but it is otherwise in very good condition despite being used. Origin: Civil War Era America. Asking price: $1950 + shipping. Cannon collecting is not for the faint of heart as pieces can be expensive and their history is often a bloody, violent one but for those interested in the warfare techniques and tools of the 19th century and behind, they can be a great item. Just be aware that this type of collection is bound to take up a lot of space and you may need to research some storage tips once you acquire one or two pieces. Luckily, as they are made of rust-proof metals, they are one of the easier collectibles to store without worrying about damage.